The Fourth of July isn’t the only Independence Day in America. On June 19, 1865, Union General Gordon Granger arrived at Galveston, Texas, bringing news to the town that the Civil War had ended and that all slaves were free. This was nearly two and a half years after President Lincoln issued the Emancipation Proclamation. Before long, the former slaves in southeastern Texas began to celebrate June 19 as Emancipation Day. Eventually, they shortened the name to Juneteenth. ​A 2009 exhibit at the Anacostia Community Museum titled Jubilee: African American Celebration featured information and artifacts related to Emancipation Day festivities like Juneteenth and other African-American traditions. “People can learn about different celebrations. It’s like looking at African-American history through the lens of these special celebrations, including Juneteenth,” said Robert Hall, associate director for education at the museum. But Juneteenth isn’t just a historical holiday; modern celebrations are increasing throughout the country, said Cliff Robinson, founder of Juneteenth.com, a site that allows individuals or groups to post information and photos from Juneteenth celebrations. I spoke with William Wiggins Jr., professor Emeritus of Folklore at Indiana University and author of Jubilation: African-American Celebrations in the Southeast, about the history and future of Juneteenth. Why did it take so long for word of the Emancipation Proclamation to reach Texas? One of the popular legends associated with that is that Lincoln dispatched Union soldiers to move throughout the South to spread the word, and it took until the 19th of June. But I think on the other end, you could perhaps say it took so long because of the resistance to emancipation itself. Texas was one of the last outposts of slavery and Galveston is sort of the epicenter. In fact, one of the last fights in the Civil War was done in Galveston and the Union forces were repelled. There had been a big resistance all along and it was because of this fact that word got slowly to east Texas. Then Gordon Granger was dispatched with a group of Union soldiers and landed at Galveston and spread the word and proceeded to go up into east Texas. He gave the executive order that slavery was no longer official and people had to compensate slaves for their labor. Texas was just sort of the outlier and took some time. What were some of the first Juneteenth celebrations like? What food was served? From the beginning to now, the food came from slave cuisine. One dish in particular was barbecue and the preparation and fixing of it harkens back to old days when a pit was dug, I would say about a foot deep, and it had saplings over it. They built a fire of oak and mesquite and whatever else that they wanted. They would place the coals on the floor of the pit and then on top of the pit, they would place a hog that had been killed, gutted and they would rotate its position. Starting off, the carcass would be cut-side down and skin side up and it would cook very, very slowly until the barbecuer would flip it. Traditionally (cooking) was an all-night thing and they would be gathered by friends and sit around drinking spirited beverages. It emphasized the comaraderie and that barbecue would be the main dish. Then there was watermelon, too. There was the strawberry pop. By any other name, it would be a picnic or Sunday dinner at its best. At the heart of it, just like turkey at Thanksgiving, the central entrée would be barbecue. And again, barbecue preparation has deep roots in slave culture. 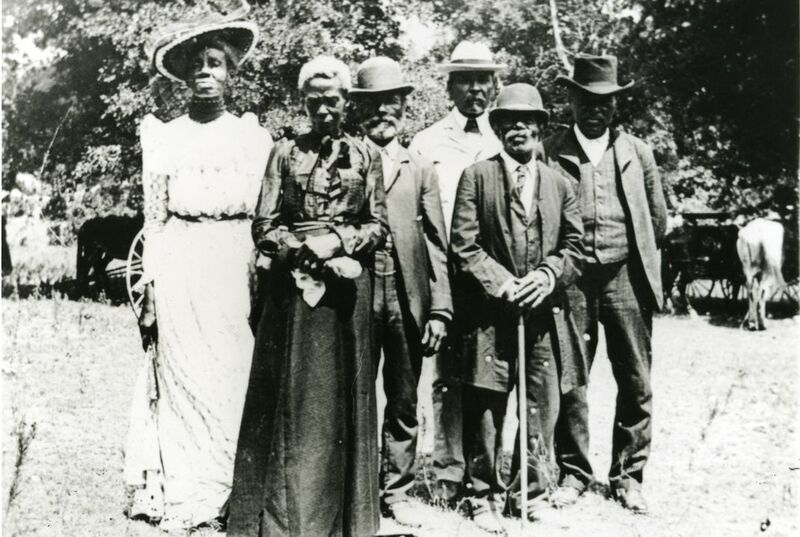 How did Juneteenth celebrations spread out of Texas? The movement of this celebration was part of a larger group of emancipation days across the south. The first movement, right around WWII, was westward. So where you had black families moving to California from east Texas, and southwest Arkansas and Oklahoma, to work in the shipyards, or to work in the airplane factories, then Juneteenth started cropping up in those states. When Dr. King had the Poor People’s March and Ralph Abernathy promised King (who died April 4, 1968) that this march would be completed and it was. So they made it to Washington and they set up a camp on the mall. Everything that could go wrong did and they had to leave at the end of the summer. So how can you leave with some sense of honor? It was late June and there were people from all different states in that village for that summer, so they had a group from Texas and someone said ‘Why don’t we have a Juneteenth celebration,’ which again is a way to address poverty and freedom and harkening back to our past. They had this closing celebration, which was held on that day, and a large number of entertainers performed. My theory is that these delegates for the summer took that idea of the celebration back to their respective communities. So I know, for example, there was one in Milwaukee, and looking at the newspapers after that summer, they started having regular Juneteenth celebrations. The Chicago Defender had an editorial that it should be a regular idea. My feeling is that because it was used to close the Poor Peoples Campaign that the idea and so forth was taken back by different participants in that march and it took root around the country. It has taken on a life of its own. What is similar or different about the Juneteenth celebrations in the past and present? In terms of the date and coming back, it is just a good time with homemade ice cream, baseball games and all that sort of stuff. What has changed and what has been put in there, is the whole shift, and not so-subtle shift, to emphasizing the family. These events, more and more, are being seen as instances to reaffirm and reestablish family ties. The weekend invariably would end with church service or, just like Memorial Day or Fourth of July, a visit to family burial grounds to partake in the rich telling of the stories of the ancestors.